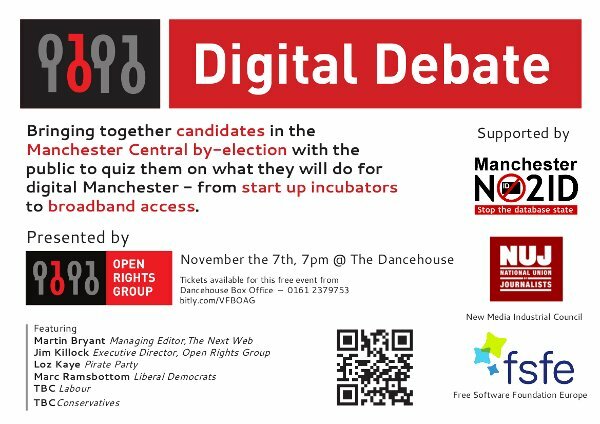 Manchester Central candidates will be invited to explain how they will support the local digital economy and defend citizen’s privacy and free speech online. 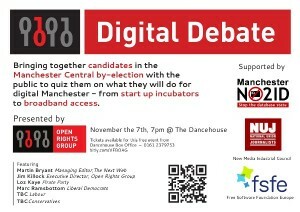 How would candidates follow up on recent initiatives to make Manchester a Digital Hub on a world scale? Can they stop the brain drain to London and other cities better able to support growing digital businesses? Have your say about digital issues! This event is a partnership between the following groups NUJ New Media Industrial Council, Free Software Foundation Europe, Manchester Open Rights Group and Manchester No2ID. This entry was posted in digital debate, digital rights, event. Bookmark the permalink.